Dr. Oz has some shocking news about your favorite foods and you may not even believe him. Food fraud is the subject of his February 11 2013 show and Dr. Oz is appalled at the notion of himself, or any of viewers being the victim of food fraud. Keep reading to get the information you need to on how grocery stores around America are tricking customers and how you can avoid the fraud. Dr. Oz went over how to avoid food fraud with fish, what fish are being swapped with other fish and the dangers of consuming some types of fish. Shaun Kennedy, Director of the National Center for Food Protection & Defense, defined food fraud for Dr. Oz and his viewers as buying a product based on the label and coming to find out the food is not what it appears to be, which the FDA refers to economically altered adulteration. He said many companies try to sell something cheaper than what you think you are buying and it is a practice that could be making you sick. Shaun Kennedy told Dr. Oz food fraud is happening more often nowadays because companies are trying to turn a bigger profit. 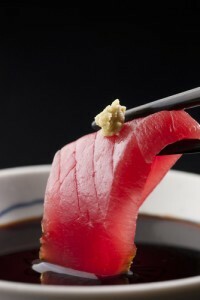 Dr. Oz said one of the biggest places for food fraud occurs with fish, especially in sushi. He said expensive fish is often replaced with cheaper fish and it can be nearly impossible to tell sometimes. Beth Lowell, Campaign Director at Oceana, said the organization investigated fish fraud in the United States and found 38 percent of what they received was not what they thought they were purchasing. By testing the fish they purchased, Lowell said they were able to determine much of the more expensive fish they bought was replaced with much cheaper fish. Dr. Oz was simply stunned nearly half of the fish we are buying is mislabeled. Cod, wild salmon, red snapper, and grouper are some of the most common fish being swapped out for cheaper replacements, said Lowell. Kennedy said many other cultures serve their fish whole because it is hard to figure out what kind of fillet you bought if you didn’t see where it came from in the first place. One of the most common food frauds occurs with tuna and to prove it Dr. Oz challenged a self-professed fish expert from the audience to see if she could tell the difference between a real tuna fillet and a fish that it might be swapped out for, but she had a tough time. After her attempt at choosing the “right” tuna, Dr. Oz explained the frightening part about not being able to tell what fish you is eating is you might be eating Escolar, a fish which carries a toxin that causes diarrhea in humans. The risk for diarrhea is so high, Escolar is often called the ex-lax of fish and has been banned in Italy and Japan. Lowell warned everyone to avoid “tuna” or “super white tuna” on any menu because it was the number one area she found food fraud in her food fraud investigation. Another common swap happening at your fish counter is with red snapper. Although they look similar, instead of getting a red snapper, you may be purchasing a tilefish, a much cheaper fish which causes health problems due to a high mercury content. Tilefish can be so bad for you, the FDA has it on their “do not eat” list for pregnant women and children. Lowell shared another common swap is done with Grouper, which is often traded out for Catfish because catfish is much cheaper. She says until we can follow the path of our fish from boat to plate, we need to be diligent when making fish purchases for our families. Dr. Oz gave his best advice for avoiding fish fraud.